Fill out the information below, and within approximately 1-2 working days you will receive a ring sizer free of charge, in the post that will ensure an accurate fit. Finger sizes do not correspond to bodily size. Your fingers will swell in the evening and shrink in the morning. 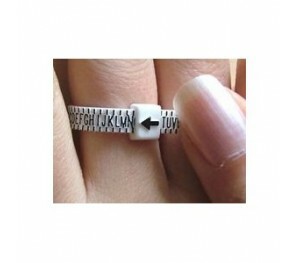 Other factors that contribute to ring size include temperature, humidity and exercise. Wider bands can be bought looser as can be rings for someone with large knuckles while smaller knuckles need a firmer fit. The best size fits snugly but has al little resistance when you remove the ring. Elma Jewellery reserves the right to refuse any online application of ring sizer , without notification or explanation.